I joined this week's "Inside Boxing Live," hosted by Dan Canobbio, to preview Pacquiao-Broner and talk about Gennady Golovkin's next move in his career. Freddie Roach and Keith Thurman also appeared on the show. To watch (YouTube) or listen (iTunes) to the show, click on the links below. Tijuana, Mexico isn't the typical locale for a top American amateur to make his pro debut. But so little about Devin Haney (20-0, 13 KOs) passes for ordinary. A seven-time national junior champion and the youngest member of the USA Junior National Boxing Team, Haney took the unusual step of turning pro at 16. U.S. boxing jurisdictions wouldn't license Haney at that precocious age so he went to Mexico for his first four fights. At 17, the Nevada State Athletic Commission granted him a special waiver so he could fight on a Manny Pacquiao undercard. But Haney was just getting started. Rejecting advances from the big-moneyed promoters in the sport, Haney decided to hang his own shingle: he started Devin Haney Promotions and is now the youngest boxing promoter in America. And his company isn't merely set up for tax purposes; he's signing fighters and planning out his next steps as a promoter. Haney provided an interesting perspective on why he decided to go at it alone: "I feel like a lot of fighters promote themselves already using social media and word of mouth," he said. "But the people who they're signed to, their promoters, are taking credit for it. I was built in the amateurs and I didn't go to the Olympics. I went on You Tube and social media. I always felt like I promoted myself, so why not take it all the way? I want to inspire people – that you can be your own promoter." And while most 20-year-old prospects are still plying their trade deep on undercards or on small club shows, Haney will be headlining his third ShoBox card on Friday, where he faces undefeated South African Xolisani Ndongeni (25-0, 13 KOs). So where does Haney's moxie come from? 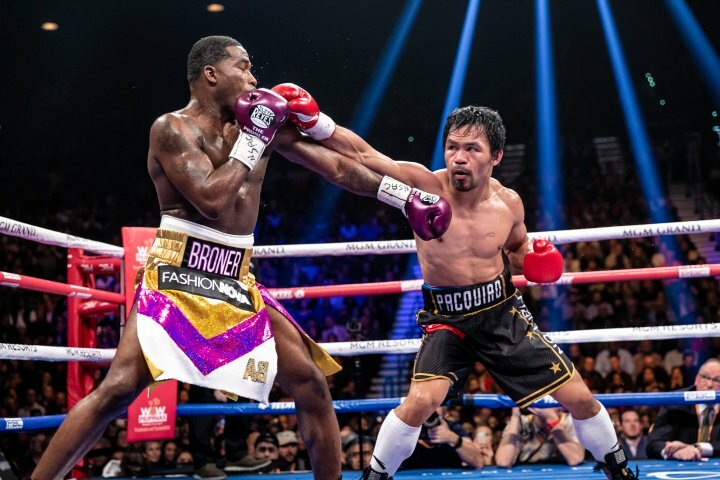 That answer can be found in the gyms of Las Vegas and Oakland, where he's been mentored by boxing royalty over the past 12 years and has sparred with many of the best fighters in the sport. Floyd Mayweather Sr. was a former trainer of his. So was Roy Jones. When he returns to his boyhood home of Oakland, he trains at Andre Ward's gym. "I've sparred world champions," he said, "Floyd Mayweather, Shawn Porter, Zab Judah, Jessie Vargas, and the list goes on. That's why I feel like I'm seasoned. On paper, it doesn't show that, but being in the ring, I have the experience. That's why I feel like I'm on a whole different level." He's also sparred with some of the top young American prospects on the scene, including Shakur Stevenson, Teofimo Lopez and Gervonta Davis. Although Haney didn't want to go into details regarding those sessions, he did mention that he fought Ryan Garcia six times in the amateurs, where they each won three bouts. Haney finished his amateur career with a sterling 130-8 record. Last year was a pivotal one for Haney. 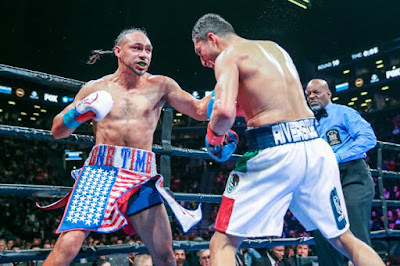 He appeared on Showtime twice and looked impressive in a stoppage win over Mason Menard and a wide decision victory against Juan Carlos Burgos. Both of those opponents were experienced pros with notable names on their resumes. Yet neither was a match for Haney. "Those fights just brought more confidence to me, knowing that I could compete with top guys," he said. "When I fought Mason Menard, a lot of people were telling me that it was a huge step up, that they didn't know if I was ready. You know, he was a knockout artist...this and that. 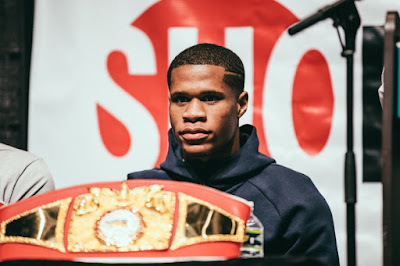 But I showed myself and I showed the world who Devin Haney is." Haney has a lot of respect for Friday's opponent, Ndongeni, 28, who was a highly regarded prospect in South Africa and has also been ranked in the Top-15 by sanctioning organizations. Ndongeni can be slick and cagey; Haney is ready for the challenge. After 12 years in boxing, Haney is close to a title shot. He feels it and it motivates him. He understands that without being affiliated with a big promoter, he's going to have to play the rankings game with the sanctioning bodies to get a title shot. He also knows that he will have to beat talented fighters to win a belt. "It feels great being close to that goal. All the work that you put in is paying off. It's making me even hungrier to be where I want to be...I'm ranked in the Top 10 and eventually I'm going to be the mandatory to fight the top guys. And if they don't fight me, they're going to have to vacate. I'm not worried." And Devin's not worried. He posts many of his sparring sessions online, something that very few fighters do. He isn't concerned that potential opponents could spot flaws. He's more interested in building his following and bringing the sport closer to the fans. In the ring Haney is a hybrid-style fighter. Comfortable on the inside or at range, Haney has fast hands and throws pinpoint combinations, but what separates him from many other top prospects is his attention to detail on the defensive end. Although he doesn't shy away from contact, he's certainly not the type to take a shot to land one. He certainly believes in the principle of "hit and not get hit in return." Perhaps his experiences in Mexico helped to crystalize the importance of defense. "When I was fighting in Tijuana, fights were tough because when you go there, you're on enemy territory. If a guy barely misses you with a punch, the crowd goes wild...You never know if they're going to stop the fight because of cuts, or for whatever reason. So you have to be on your "A" game every time." Like all fighters, Haney understands that there is room for improvement. His father Bill, his head trainer, has been working with him to emphasize more body punching and also to make quicker adjustments in the ring. Devin believes that while he may be gifted, he also knows that his mentors, Mayweather and Ward, for example, always kept working to improve. Similar to those two, Devin wants to be considered as one of the best in boxing. But he's in no rush to follow well-worn paths to get there. He wants to fight the big names and to receive the glory that comes from being on top, but on his terms. He's calling his shots. And Haney's unique career path begs several questions: Is Haney right in that top promoters are extraneous? Is he being naive? Will business demands divert his attention from reaching his apex as a fighter? Should Haney keep on winning, he could create a new paradigm for young fighters. But if he fails to reach his potential, he has already provided fodder for potential second-guessing. It's a fascinating series of decisions that he has undertaken. Haney's precocious talent will be on display on Friday. Although he's still young and there is ample time for improvement, his skills and pedigree have moved him beyond showcase fights. At this stage of his career, every opponent will be expecting to win. And this is what Haney signed up for; this is why he demanded to start his pro career early. He wanted to test himself against the best. Haney's trial by fire is about to begin. And one gets the feeling that he wouldn't want it any other way. He believes his time is now.